KATHMANDU, Feb 9: The fifth series of 'Nepal Buildcon International Expo' kicked off in Kathmandu on Friday. The expo was inaugurated by Minister for Urban Development Mohammad Istiyak Rai amid a ceremony held at Bhrikuti Mandap. Aarti Strips Pvt Ltd is the lead sponsor of the expo. With an aim to bring architects, designers, developers, engineers, contracting companies, material suppliers, and technology providers under one roof for displaying and sourcing different products, the expo this year will feature nearly 150 stalls, according to the organizers. Addressing the inaugural ceremony, Minister Rai said that the construction sector can play an important role in the economic development of the country. Stating that the construction industry was witnessing a robust growth, Rai called for enhancing the quality of domestic products. Companies, dealers, sub-dealers, and producers are participating in the expo to showcase their products including construction materials, construction machinery, construction heavy equipment, pre-fab structures, UPVC windows machinery, UPVC profile, doors and windows, architectural hardware, bathroom fittings, pipes, tiles and sanitary ware, among others. The expo will continue till Sunday. The organizers are expecting nearly 50,000 visitors in the three-day expo. Last year, over 30,000 visitors had visited the expo. Representative of the stalls in the expo said that they were upbeat with the responses and participation of visitors on the first day. “Despite adverse weather condition on the first day, the flow of visitors and their feedback has been encouraging,” said Jagannath Dahal of Jagdamba Concreto, which has set up its stall with a traditional Nepali theme. 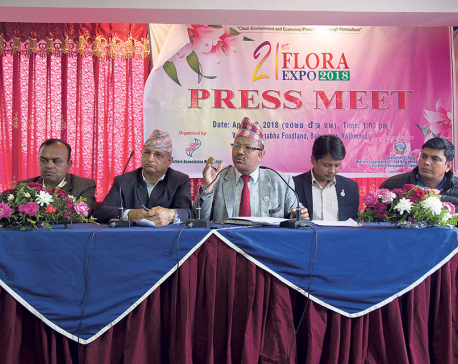 “We hope that an overwhelming number of visitors will throng the expo,” added Dahal. Jagdamba Concreto is a block industry that manufactures hollow blocks, bricks, and pavers. Not only construction materials and products will be on showcase, visitors will also be able to get information and knowledge on various aspects of construction, designing, and architecture, and interior design, according to the organizers. “Visitors will get opportunities to know how to select materials and construction-related services in the expo. Participating stalls will share information as to which products are economic, feasible or reliable,” said Pragyan Bhattarai of Aarti Strips Pvt Ltd. The organizers said that the expo will play positive role in the ongoing reconstruction initiative of the country. According to a statement issued on Friday, the expo is aimed at contributing to the economic growth, fostering competitiveness, and facilitating infrastructure investments in the country.